Everyone’s favorite carbonated drink can only get better when you’re able to create your own flavors right in your family kitchen. As a long time soda enthusiast, the introduction to home soda makers revolutionized the way I think about my favorite drink. As someone who is always interested in making what I consume from scratch and trying to reduce my carbon footprint, making my favorite soda drinks at home is a sustainable dream come true. If you love having a fizzy sip every now and then, but you can’t stand buying cartloads of bottles and cans at the store, there’s great news. Allow me to introduce you to some of the best soda makers on the market today and get you started making your own carbonated drinks at home. Take a look at my quick comparison chart for a glance at which soda makers I’ll be reviewing. If the idea of making carbonated drinks at home feels like a bit much, don’t worry. I’m here to guide you through the process of choosing the perfect model for your needs. I’ve researched and gathered together this list of the best soda makers for a variety of drink lovers. I’ve also made sure to include my reviews of the best syrups and bottles to complete the home soda making experience. Let’s get started! 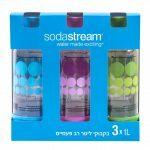 The original Soda Stream that revolutionized the way we think of soda is still at the top of the market today. The countertop design that made it a gift sensation just a few years ago has kept it as a top seller in the home soda-making category. Besides its convenient size, the Soda Stream model is number one when it comes to sustainability and taste. It’s perfect for newcomers to the trend. It contains a BPA-free reusable-carbonating bottle that holds 1 liter of freshly made soda and mini CO2 carbonator. Once you’ve finished off the first bottle of carbonated gas, the Soda Stream offers a free mail in rebate for the 60-liter bottle. But don’t worry; you don’t have to send out for your delicious soda every time. The carbonation canisters can be refilled at many popular retailers, such as Wal-Mart and Bed, Bath, and Beyond. The canisters are easy to load and reusable. The biggest size available is the 60-liter option that will last a medium sized family for multiple uses. This ensures you get plenty of soda out of each batch. The specialized syrups that go with this model come in nearly every flavor imaginable. The taste from the Soda Stream is crisp and can be achieved with just a few ingredients in less than ten minutes. 40 flavor options let you create custom drinks for every member of your family right from your own kitchen. These Soda Stream syrups are great if you love soda but don’t love the added flavorings, sugars, and artificial sweeteners that plague the mainstream soda industry. The Soda Stream lets you know exactly what you put into your glass of soda each and every time you make you. Not to mention, the Soda Stream requires no batteries or electricity to run. Kitchenaid is a well-known brand of kitchen appliances, so it should come as no surprise that this soda stream from the trusted company definitely deserves a mention. Weighing 17 pounds and made of durable die-cast metal, this sturdy machine comes with 3 reusable flavors, a 1 liter reusable bottle and a 3 ounce CO2 tank or a larger 60 liter CO2 tank. The large reusable bottle means you can create a large amount of soda water at one time, and will not run out on you in the middle of dinner. Like other Kitchenaid products, this soda stream is solidly built, much more than other soda makers. The carbonation lever comes with a soft grip handle and 4 different settings, allowing you to customize your level of carbonation in your drink with ease. 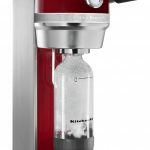 Kitchenaid also worked with Soda Stream on creating their model of soda maker, so it is compatible with soda stream products, including over 60 different Soda Stream flavors and other canisters. Those concerned with health and clean living will be glad to know the reusable bottles included with this soda stream are BPA-free, so you won’t have to worry about exposing you or your loved ones to harmful chemicals. Using the reusable bottles also helps cut down on plastic waste, and combined with the metal design, scores some sustainability points for this model. Available in 8 different colors, ranging from tangerine to green apple, this soda maker brings a characteristic Kitchenaid pop into your kitchen. If you are a fan of other Kitchenaid products, this soda stream will fit right into your style. This soda stream is a little more expensive than other models, but it makes up the difference with Kitchenaid’s dedication to high quality materials and a clever partnership with Soda Stream that gives this model serious flexibility. The Cuisinart Soda Maker is another great option for anyone looking to break into the home soda-making world. 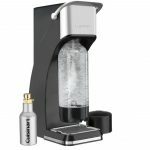 From a trusted brand, this soda maker uses CO2 cartridges compatible with Cuisinart appliances to create carbonated water, sodas, and even cocktails. It’s a versatile addition to any home bar or family kitchen. At only four pounds, this model is lightweight and easy to move and store. It won’t take up much counter space, but if you plan to only use your soda stream every now and then it helps to have a model that fits away until it is wanted. When you purchase this soda maker from Cuisinart, you’ll be ready to create crisp and tasty drinks right away. The model includes one starter CO2 canister that will let you make up to 16-liters of personalized soda. You’ll also receive a BPA-free storage bottle to keep your newly made drinks fresh and ready to sip. This comes in handy when you want to make a large batch to store for a movie night or dinner party. Forget last minute runs to the grocery store for more drinks! Everything you need to keep your events running smoothly is right on your counter. If the idea of pressurized gas makes you nervous, you’re not alone. With the Cuisinart model you don’t have to fear. Installing the CO2 canisters is easy with the quick install method featured on this model. Plus, it’s easy to clean if any messes do occur. The removable tray collects any drips or spills for a fast and easy cleaning. Use this model for creating sparkling water and other beverages your family will adore. With the carbonation bar, you decide how many bubbles to add to your water. This allows you to personalize the taste and carbonation level for each drink you make. It’s the perfect trick for large families of discerning soda lovers. For the counter space challenged among us, there’s this handheld option from Hamilton Beach. The Fizzini Soda Maker is a space saving alternative that still delivers quality soda products. You don’t have to give up hopes of perfectly homebrewed sodas in the name of storage space with this little appliance. This almost pocket sized model lets you have all the power of a countertop soda maker right in the palm of you hand. The handheld carbonating wand can be attached to the Hamilton Beach one liter bottle that is included with your purchase. The easy to attach method means that even your youngest soda enthusiasts can enjoy making their favorite drinks at home with ease. At only 2 pounds, this little model is the perfect answer to the size issue some might have with the models listed above. However, there’s no need to worry about making too many sacrifices in the name of storage. The small size still delivers on strength and customization when it comes to making quality soda products at home. It offers adjustable fizz control to ensure you get the right amount of carbonation every time and can be used with any combination of syrups to deliver that perfect taste. The Fizzini is also another environmentally friendly option for making homemade sodas. 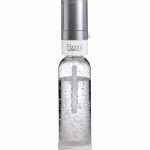 It uses recyclable 8-gram CO2 canisters to create those signature bubbles in each bottle. When you buy the starter, you receive 10 canisters to begin your soda making adventure. This model is probably best for those without a daily soda drinking habit. If you only plan on making a few liters every once in a while, this model is a great way to save space and experiment with soda making. However, if you plan to make soda frequently or for larger groups then this handheld model might not be enough to fit your needs. Once you’ve chosen the best soda maker for you and your needs, the next step is finding the right syrup to make your sodas taste great. While you can drink the carbonated water straight from the bottle, getting syrup and making a fizzy sweet drink tailored to your taste is half the fun of a soda maker. It is important to purchase soda syrup, and not just regular syrup. Using regular syrup will cause water to fizz up out of the bottle, making a mess and ruining your homemade soda. Try these options below for great soda syrup. Starting off our list of syrups is Soda Stream Cola Syrup, which comes in 14.8 fluid once bottles. The Cola Syrup comes with that classic Cola flavor, so if you want good, all-purpose syrup to start off your soda making adventures, this is the syrup for you. The Cola flavor is a crowd pleaser, so if you are serving anyone with specific tastes, you can accommodate them. Soda Stream’s Cola flavored syrup contains less sugar than syrup in store-bought sodas, so you won’t be filling up on empty calories and fattening sugars. It also does not contain any Aspartame, a common artificial sweetener found in many diet sodas, and no high-fructose corn syrup. This lets you explore the world of soda making without worrying about the health problems associated with drinking sugary carbonated beverages bought at the store. The low cost of this product makes it a great introduction to the world of soda making, and its focus on low-sugar will make sure your waistline doesn’t expand too much as you enjoy your new soda maker. Soda Stream’s Cola Syrup is an affordable, health-conscious option that you will likely be coming back to again and again in your bubbly adventures. Once you’ve dipped your toe into the sweet waters of soda syrup, this collection of small-batch syrups might catch your eye. These syrups are made with no artificial preservatives or flavors, and are crafted with dedication to the old soda making tradition. That means these syrups are made with a focus on organic herbs, roots, fruits and spices. These are also made with organic cane sugar, and contain no corn syrup. This set comes with six flavors: lavender, kola, ginger ale, cherry cola, orange and root beer. The ingredients used in these syrups are gluten and GMO free, and contain no animal products, so they are safe for vegans. The different flavors are not the exact same as more mainstream products and take some adjusting, but they are great in their own right. If you are tired of the same high-sugar, artificially flavored soda syrup, try this set for an adventurous and health-conscious soda drink. Our final syrup takes inspiration from the soda making tradition of Italy. The Torani brand is highly recognized in the world of syrups, and make syrups for every from lattes to smoothies. 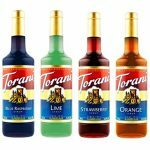 Torani has returned to its Italian roots by offering this Soda syrup pack that lets you make some delicious Italian sodas with your soda maker. The pack comes with some class Italian soda flavors: Blue Raspberry, Strawberry, Lime and Orange. These syrups are naturally flavored and are inspired by the original hand-written recipes that founded the Torani brand. You can also get more adventurous and use these syrups in iced tea or other cold drinks, with or without carbonation. If you are looking for a well-made collection of syrups from a trusted brand, consider these Torani syrups. They will help you create new and interesting flavors and sodas from your soda maker. Even with the perfect soda maker all picked out and your favorite syrup on tap, you still need high quality bottles to have the best soda making experience possible. Every brand requires its own unique bottle type for optimal soda making. That’s why I’ve done the work for you and picked out the best bottles for each brand that’s already listed above. No matter how you plan to use your soda-streaming device, these top quality bottles will ensure your creations stay as fresh and fizzy as the day they were made. Feel free to use this handy guide when making your final bottle selections based on your drink making habits and model. This guide will allow you to pick the perfect bottles to match the soda maker you’ve already chosen. With the complete set of bottles, syrup, and a carbonating machine, your soda making powers will be truly unstoppable! For my number one soda maker, the Soda Stream, the top pick for bottles has to be this tri-colored set made specifically to compliment the appliance. Three bottles included in one pack is already a great deal, but when we factor in the size and durability their value only increases. Each of the three bottles will hold 1 liter of freshly made soda and has a tight seal lid to keep the fresh bubbles tasting great even days after you make your soda. The bottles come in purple, blue, and green. This makes them an ideal choice for families who want to keep their own personal flavors separate from everyone else. They are BPA-free and machine washable which lets you worry less and enjoy more. 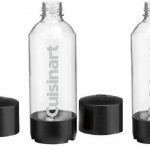 If you’re looking for a handy spare or replacement bottle for your Soda Stream, these are the best addition for the value you can make to your home soda making experience. 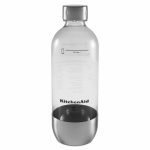 This stainless steel bottle is made to go perfectly with your Kitchenaid soda stream device. It’s a serious upgrade compared to the generic bottle that comes with the soda maker to begin with. With a stainless steel bottom and BPA-free plastic exterior, it’s a sturdy bottle that will keep your soda fresh and cool. These bottles might not be machine washable, but they are completely reusable and feature a helpful fill-line indication to make sure you never waste any of your homemade, delicious soda. 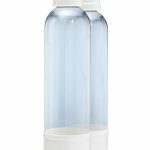 The lock-tight lid and natural soda bottle shape make these bottles easy to carry and secure enough for use outside the kitchen. Purchase a couple of these quality bottles to keep your whole family satisfied with tasty drinks on the go. They make creating and enjoying your favorite flavored drink combinations a breeze. The Cuisinart soda making system comes with a starter bottle when you buy the machine, but for some soda enthusiasts it’s just not enough. This 3 pack of soda bottles made specifically for this model give you an element of variety whether you’re making soda for yourself or your entire family. Experiment with different flavors and keep your drink separate from everyone else’s with these individualized 1-liter bottles. Each bottle is BPA-free with a threaded connection cap for safe and spill free drinking throughout your day. These bottles make it easy to create different flavors for all the members of your family for a nice lunch at home or a day of adventures. Be sure to check the expiration date on you bottles as they do expire after some time has passed. It’s best to recycle them after their expiration date to ensure top quality bottles are always ready to go when you’re craving delicious soda made at home. 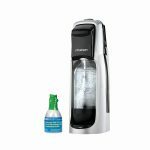 This two-pack of carbonating bottles from Hamilton Beach combines perfectly with the Hamilton Beach handheld soda maker, as it is designed specifically to fit the Fizzini. At a 1-liter capacity per bottle, these bottles are great for making and storing your own soda, allowing you to switch flavors or carbonation levels between bottles. 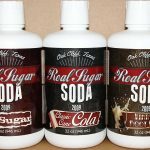 If you are a single person of a small family of casual soda drinkers, these bottles are ideal for personalized drinks. The bottles are also BPA-free, keeping you and your sodas free from harmful chemicals. These bottles are hand wash only, which might be slightly inconvenient if you use them often. However, for the casual soda drinker, these bottles pair well with the handheld model that fits in your drawer. Has Soda Stream Lost the Battle for the Best Soda Maker on the Market? The soda maker industry has seen a jump in competitors since the first model brought the method of making soda straight to our kitchens. The original at-home soda maker, The Soda Stream, still has a corner on the top of the market for at home drink making systems. However, since its debut, more and more models have started to bring their own unique twist to the trend. For us true soda junkies, this is great news since this competition can only equate to new developments as the trend continues. While Soda Stream still remains at the top of my list for pumping out consistently flavorful and cost effective soda products, it’s interesting to watch new companies join the soda streaming market. Much like the classic debate between Coca-Cola and Pepsi, future soda lovers might find themselves debating Kitchenaid over Soda Stream. If you’re reading this and you already have your favorite home soda maker brand locked down, let us know in the comments. Have you tried more than one system? What sealed the deal for you and made you an at-home soda-making convert? Share your story with fellow soda lovers below and let us know why you love making your own soda at home. Cheyanne is an American expat currently living in China. She works as a freelance writer/editor and enjoys traveling, writing, and promoting gender equality. You can read more of her work at www.thethistlette.com. Kitchenaid Soda Stream seems great but I find I slow when the water turns into soda and it leaks up CO2 whenever I’m using it.